Erobern Sie das zerklüftete Gelände des beliebten Broken Arrow Trail in Sedona in einem 4WD-Fahrzeug während dieser 2-stündigen Tour. Hüpfe mit und bleib fest, während dein Guide die wichtigsten Sehenswürdigkeiten und Fotoaufnahmen zwischen den roten Felsformationen anzeigt. 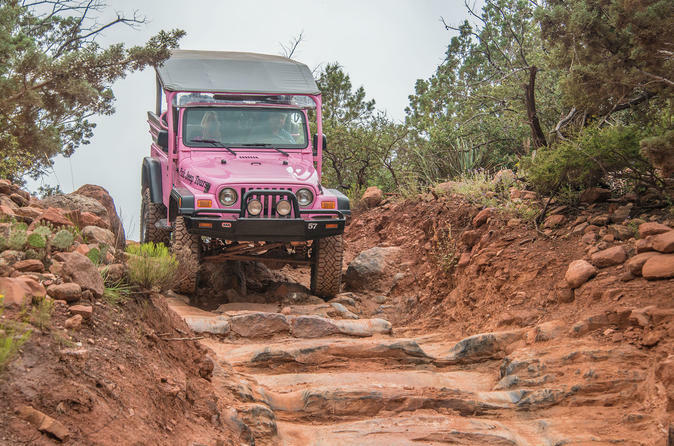 Finden Sie Ihren Weg zu einem vorher vereinbarten Treffpunkt in Sedona, wo Sie Ihr Reiseleiter in einem hellrosa Freiluft-Jeep Wrangler erwartet. Steigen Sie mit Ihren Mitreisenden (das Fahrzeug fasst sechs bis neun Personen) ein und steigen Sie in die Wüste aus. Wenn Sie den Sicherheitsgurt festgeschnallt haben, stoßen Sie über den schroffen Weg, der von dramatischen Sandsteinformationen und Sedonas berühmten roten Felsen gesäumt ist. Halten Sie an Aussichtspunkten und Fotoaufnahmen von berühmten Formationen wie Chapel Butte und Bell Rock, und steigen Sie dann die Straße ohne Wiederkehr ab. Ihr 2-stündiges Abenteuer endet mit der Rückgabe am Abholpunkt. Lisa and I did the Broken Arrow ride. I told Lisa there were only a few steep places. She was very nervous. Vince, our driver, had the whole bunch eating out of his hand. By the time we were on the road , she was impressed and trusted Vince's Skills. The Best of all Jeep rides. We had a great time with our guide Kyle! Awesome scenery and thrilling jeep ride. Felt completely safe the whole time, highly recommended. This was the perfect way to kickoff our trip in Sedona! Bonnie was our driver and she was the best! Quite the expert behind the wheel and also very informative. We loved it! 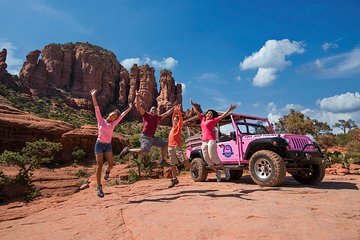 Wonderful experience and a definite MUST do during your time in Sedona.You will have the opportunity to see the area and have some amazing scenic views. Our guide was very informative, friendly and safe! We felt comfortable and had fun. This was super fun! The tour itself was one of those things that you could never do yourself or if you did it would not compare. Our tour guide was an avid mountain biker so he brought a totally unique perspective to the tour. Duff was funny and more importantly extremely capable to guide this tour. It was worth the price. Our driver was very nice and talkative. His experiences and knowledge of the area was great and helped make the beautiful scenery a great time. Always wanted to try off roading but would never do it myself! We had a great guide and saw the rocks from places we would never have access to on our own! The guide was super friendly- even helped taking pictures. We had one of the new jeeps that has all forward facing seats which was great... everyone got to enjoy all the views! Super fun adventure. Glad we went early in the morning and not on a Saturday! so we only encountered one or two other vehicles and had the rest of the day to hike. Highly recommend!